On May 5, DUSC players and their families from the Girls Academy attended the Sky Blue v. Houston Dash game at Yurcak Field, Rutgers University in Piscataway, NJ. The teams play in the National Women's Soccer League. With rosters drawn from national teams from around the world — including the US's own Carli Lloyd, Savannah McCaskill and Jane Campbell — the game provided the opportunity to see some of the highest level soccer in the U.S. 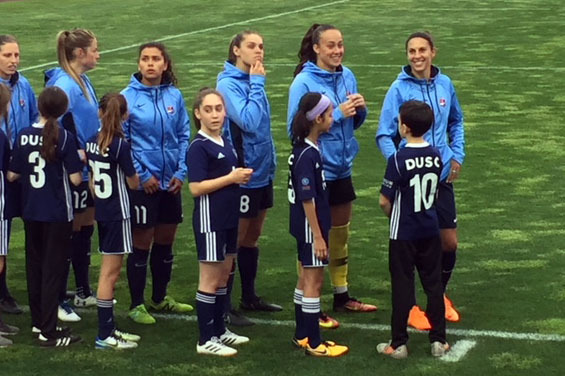 Highlights of the evening included DUSC players serving as player escorts for the Sky Blue and Dash players as they walked onto the field for the national anthem. The players also participated in an on-field half-time parade and received a high-five from Sky Blue President and General Manger Tony Novo. “It was great to see the DUSC players interacting with the Sky Blue and Dash teams. They have not stopped talking about the conversations they had with ‘their’ player during the walkout to the field. We look forward to partnering with Sky Blue to do more events like this in the future,” said Sarah Dwyer-Shick, Assistant Technical Director for DUSC’s Girls Program and Goalkeeping.